Five people were killed and 32 injured after a coach on its way to Hong Kong’s airport collided with a taxi on Friday, police said, with passengers reportedly thrown from the coach’s windows on impact. The back half of the taxi was completely crushed and part of the front of the coach sheared off following the crash on the island of Tsing Yi, images in local media showed. The taxi driver and two men and two women coach passengers were killed in the accident, police said. Local media reports described the bus as a “tourist coach” but said it had been carrying workers to the airport at the time of the crash, which happened near the exit of a tunnel. Tsing Yi is connected by a freeway to Hong Kong International Airport on neighbouring Lantau island. 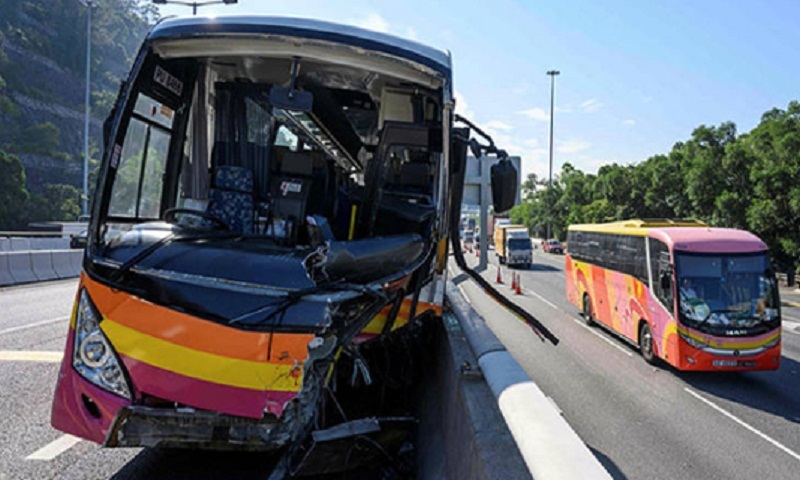 One coach passenger said the bus had been travelling fast and had crashed into a stationary taxi with its hazard lights on at the side of the road, according to SCMP. The coach seemed to have collided repeatedly with the kerb before coming to a stop, another passenger told the channel. “The bus hit once, then hit left and right, and hit the roadside to stop,” the passenger said. Television footage showed the kerb on either side of the road was damaged. The accident happened at 5:00 am (2100 GMT Thursday). In 2003 a double-decker bus collided with a truck and plummeted off a bridge, killing 21 people and injuring 20. That was the second deadliest bus accident in recent years in the semi- autonomous southern Chinese city, which prides itself on having one of the world’s best public transport systems.